The question at the heart of River Below is one that is batted about in popular culture but it rarely actually seen in action in real life, namely how far will you go to save the thing you love? Would you be willing to do the most terrible thing imaginable if you knew it would change hearts and minds? On top of that would you be willing to deal with the consequences of your actions? It’s a thorny issue but it’s the compelling question that keeps us watching all the way to the end. River Below is about the attempt to save the pink river dolphins in the Amazon river. Odd looking but absolutely charming animals they are rapidly disappearing thanks to the local fisherman killing them in order to use as bait for the Muto, a scavenger fish considered a delicacy, especially in Columbia. The killing is on a massive scale and were it not scattered across the entire Amazon would make the slaughter in the Japanese Blood Cove look like a calm day at a kids sand box. The film follows Dr. Fernando Trujillo a biologist who has been championing the animals for over 20 years as well as Richard Rasmussen a TV show host for the Brazilian National Geographic channel and a TV superstar. When a graphic video surfaces of fisherman killing and butchering a dolphin for bait the debate exploded and the dolphins gained protection but what followed was unexpected- and that is the film. 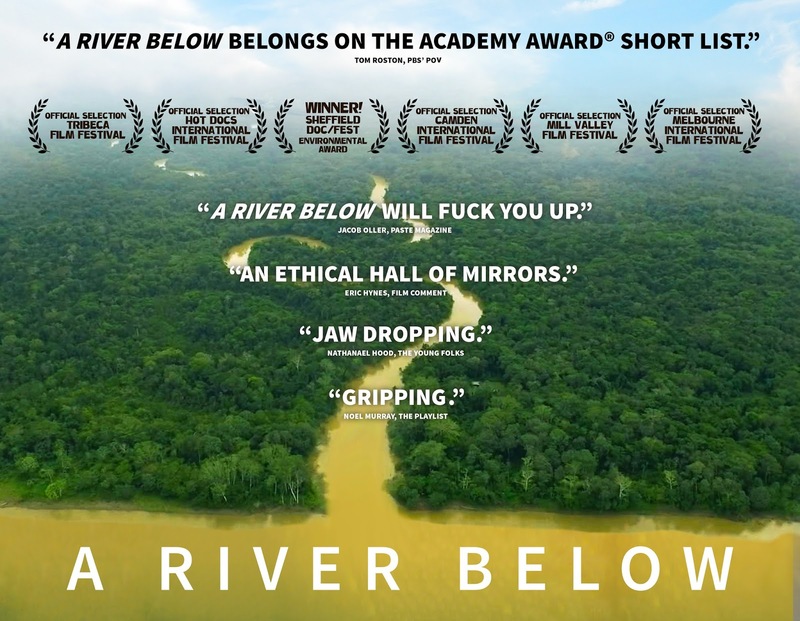 While The River Below would be special if it just dealt with the fight to save the dolphins the fact that the film takes it further to explore the fallout of the conservation makes it something more. Far too many filmmakers would have just taken it only as far as the controversy surrounding the footage but here director Mark Grieco takes it a few extra steps showing the crippling effect saving the animals has on the local communities…and the monstrous horror that the scavenger fish being caught with the dolphins is loaded with mercury-to the extent it is going to wipe out generations of the people eating it. I would like to discuss the twists and turns of the film but this is the sort of film you just need to see. Where this goes and how it plays out is deeply disturbing. It is also extremely thought provoking because it’s a film that makes you think about conservation and what it means on many levels. I don’t want to ruin the twists, because discovering them along the way force you to be slapped by what the revelations mean. I really liked this film. I love that the film is a real life examination of the question of what it takes to save a species. While I won’t join several of my colleagues in the film community who called this the best film at Tribeca, I do think it’s a wonderful piece of filmmaking and it is highly recommended. Fair warning as good as the film is, it is very graphic in its depiction of the death of the dolphins. The audience of critics at the screening audibly reacted multiple times. I say this because it makes clear why the footage changed the minds of a country. So if you don’t want to see very disturbing images stay away.